The art of carving meat lies in the direction in which you cut it. The trick is to slice confidently through each layer in a consistent, even angle against the grain of the meat (the grain can be identified by the skinny fibers that run through the meat). 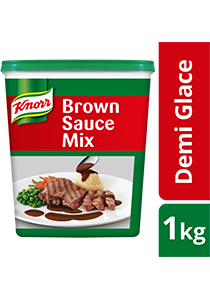 Knorr Demi Glace Brown Sauce Mix is prepared from selected ingredients. It is easy to prepare and can be used as a base for other sauces such as Bigarade Black Pepper, Bourguignonne Colbert, Madeira, Truffle and many others. A perfect combination between the greasiness of duck, corn cream, honey and the elegant aroma of lavender flowers will definitely satisfy your diners.